Among the most powerful and fast-rising syndicates in the world, the Tiger Organisation has begun to strengthen its grip, infiltrating and acquiring mass political and financial power. In the background, they have been rumoured to be the cause of the recent disappearance of martial arts masters and the tragedies of their families. 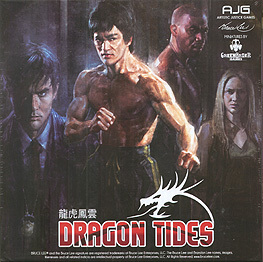 Dragon Tides is a 2-5 player Action, miniatures card and dice campaign game that lets your outcomes in each scene drive the game forward with very different outcomes. Be a part of this epic tale that will turn a ripple into a tide like no other.